It’s 2:37PM on Friday, less than a week before the first free practice session kicks off, and I finally get the call that I’ve been waiting all day for. I couldn’t believe it. We were actually going to the Nürburgring. 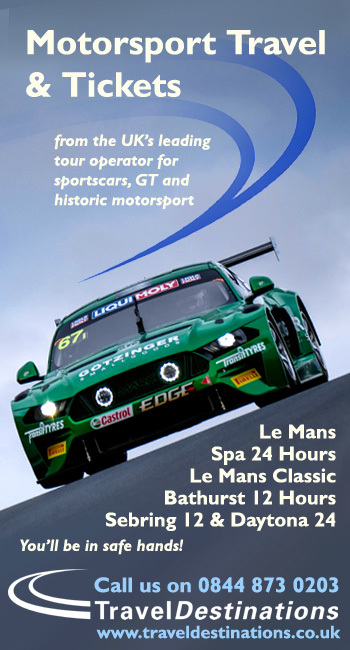 The week before I wasn’t even considering attending, but as many people know in the motorsport industry, plans can change in an instant and this was definitely one of those occasions. 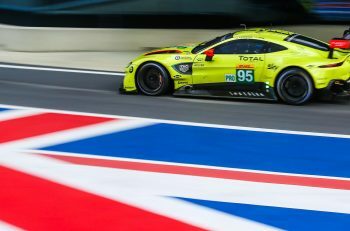 When the early hours of Saturday arrived we were all awake bright eyed and somewhat bushy tailed – desperate to get our first glimpse of a car driven in anger on the famous circuit. However, our first port of call was the paddock to get a good look around and have a close up glimpse of some of the cars that would be tackling the 24 hours. Now, I’ve been to some pretty busy pit lanes in my time but seeing the amount of cars that were crammed into a frankly, tiny garage is something that has be seen to be believed. After a quick look ring°werk and stopping for a mandatory currywurst (the first of many!) 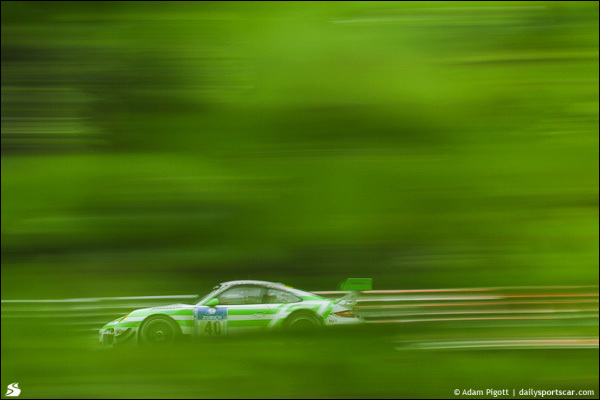 we headed out towards the Nordschleife. 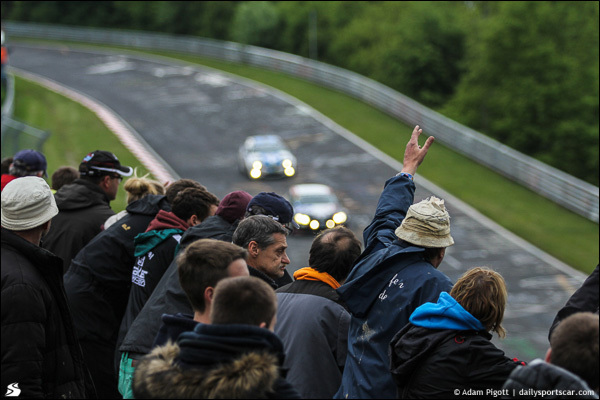 We decided that the easiest section to get to from the paddock was the Hatzenbach area of the circuit. On arrival we reverted to being excitable school children again. We were completely overwhelmed. The track’s camber, elevation change and beautiful scenery was just mind bending. And this was only a 100m stretch of track! We moved further around and found what would be one of my favourite elements from the event; the campsites. 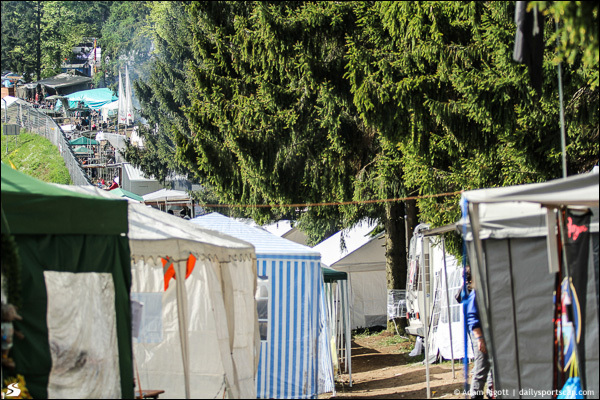 How can I describe the campsites? Bonkers, inventive, muddy, busy, expansive. I think that might just about cover it. Just when you’d begin to think you’ve seen it all, something else would appear within the forests and surprise you; brass bands, Unimogs, inflatable dinosaurs (or crocodiles – the jury was out on this), booby traps, foam parties, bars, discos, mankinis (not something I’d like to see again in a hurry), hot tubs, improvised toilets and showers and even steam rollers. The lot. 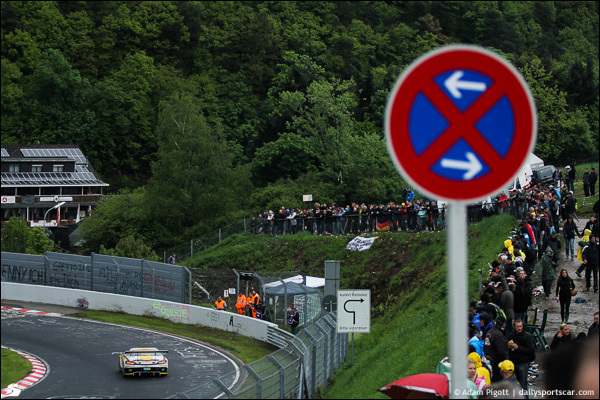 Everywhere you step at the Nürburgring has something new, something different and something to take your breath away. 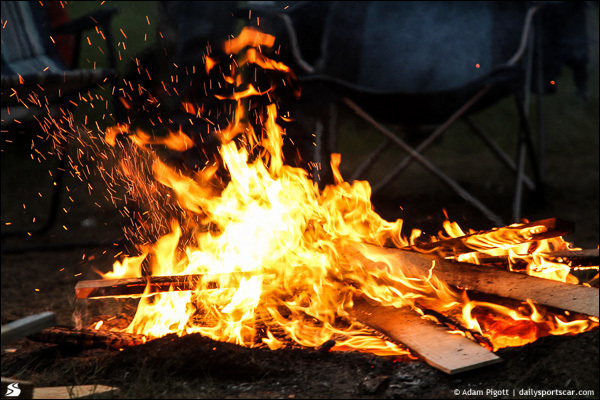 Even the smells within the campsites are strangely addictive – the smell of BBQ rose through the forests and somewhat spurred us on to walk that next kilometre. For me the most impressive element of the campsites was the behemothic towers that towered above the edge of the circuit. I’m sure that all the scaffolding in Germany could be found within the Eifel region on that weekend – I’ve never seen anything like it. 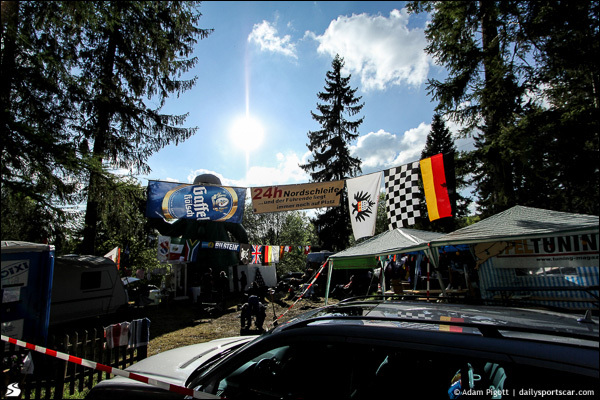 After exploring Hatzenbach during the morning session we decided that we should head to Brünchen for the afternoon’s three hour Classic race. We then went on what can only be described as a ‘magical’ 180 minute walk through the forest all the way to the Karusell. 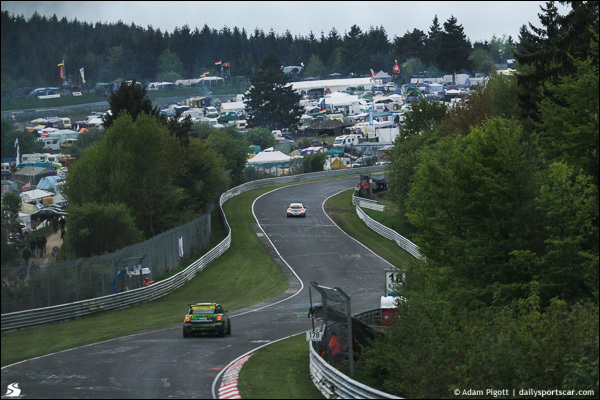 If you ever go to the N24 please, please, please walk this section; the track is stunning, the campsites are lively (but fantastic), and the cars are just ‘on it’. After a full day of exploring the circuit we were ready to experience the 24H and what drama would potentially lie ahead. 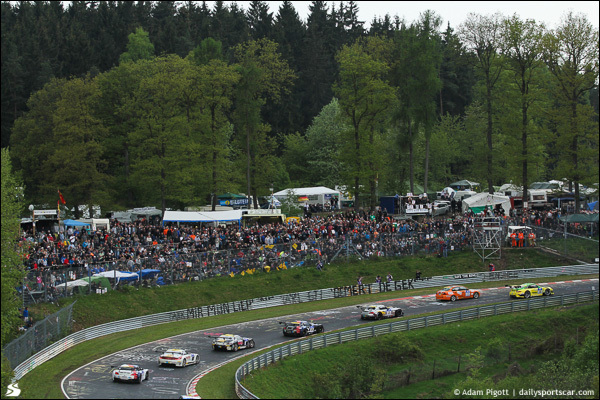 We’d decided that watching the race start on the Nordschleife was an experience we couldn’t miss out on, so picked Brünnchen as our starting point. As the start approached so did the tension. The German trance music had been turned up to 11, so much so that the two opposite ends of Brünnchen were competing for the loudest version of the ‘Michael Schumacher Song’ (if you’ve not heard of it then YouTube it – it’s worth it). Everyone was ready. As the cars came around on their formation lap you could feel the excitement brewing, the large crowd had risen to their feet in anticipation for what would be a stunning sight. 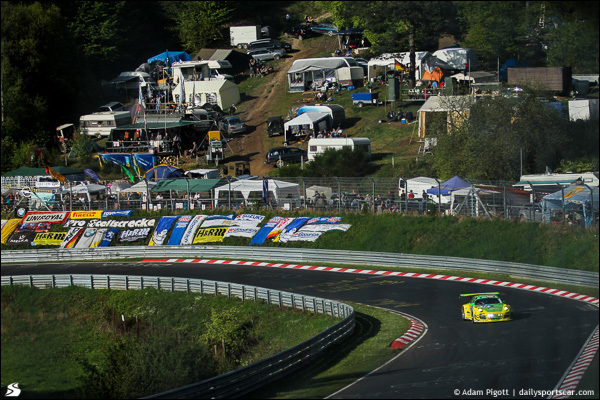 Eight minutes or so later, the cars came barrelling through the quick left then right at the top of Brünnchen before plummeting into the next sequence of corners – it was breath taking to see these full on GT3 cars neck and neck on this challenging circuit travelling at breakneck speeds. My friends and I quickly twigged onto the best way of telling when the leaders were coming around – by looking to the sky. Dozens of helicopters were rapidly following the leaders around circuit creating a scene that looked a bit similar to something you might see in a Michael Bay movie. Fireworks and explosions were of course provided by the German contingency. As the race wore on we walked towards Schwalbenschwanz for the evening session. As we arrived at the dubbed ‘mini’ Karusell the rain began to come down. Luckily some very friendly Belgians allowed us to take shelter under their massive awning whilst we prepared ourselves for the wet conditions. Little did we realise quite how hard it was raining…perhaps that rain we experienced in Belgium was a warning after all. 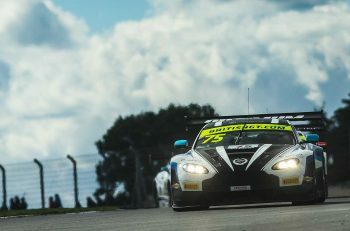 Seeing cars travel around this circuit in the wet is amazing – it’s a master class in car control as the skittish GT3 cars bounce around the track avoiding traffic as well as struggling for grip. 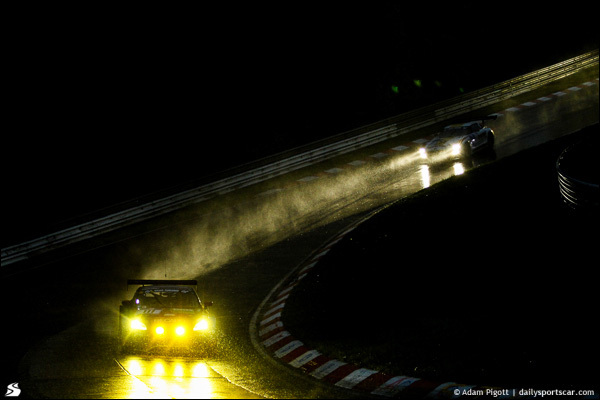 We soon enough were soaked through and headed back to the car to find some food (which is easy enough at the Nürburgring). Whilst sat in the petrol station on the Döttinger Höhe eating a small pizza like pastry, we saw what we’d all feared. Red flag. At this point we decided to head back to our apartment and get some R&R. Nine hours later we returned to a mildly moist circuit to watch Maxime Martin power through the field in a spectacular fashion. That alone was worth the entry fee. This time we decided to walk along the Adenau section of the track towards Adenauer-Forst. This is another beautiful section of track and also one of the most challenging bits, if my Gran Turismo experience is somewhat accurate. The views across the valley were incredible but seeing the Germans packing up their campsites was a saddening sight as the race began its final stint. 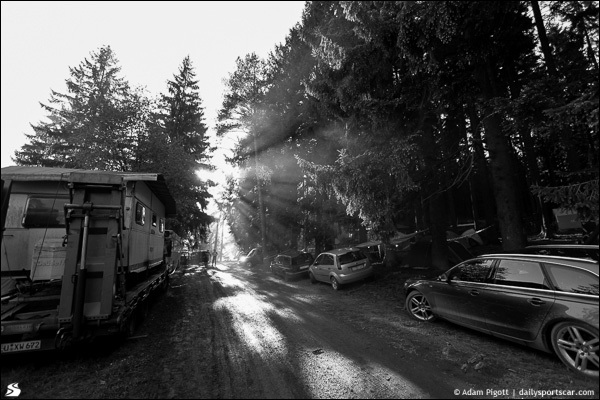 The campsites along Adenau had begun to resemble bomb sites. If you thought that Silverstone was a mess during the Grand Prix weekend in 2012 then you’ve seen nothing yet. They were slippy, messy and muddy, littered with the remains of scaffolding towers and race setups consisting of TVs and sofas; we were amazed at what was being left behind. The finish was just as special as we’d hoped – granted we didn’t get to go around to the Grand Prix straight but we ran out of time. That said the cheers and whistles as the cars came round was fantastic, even at Adneau. 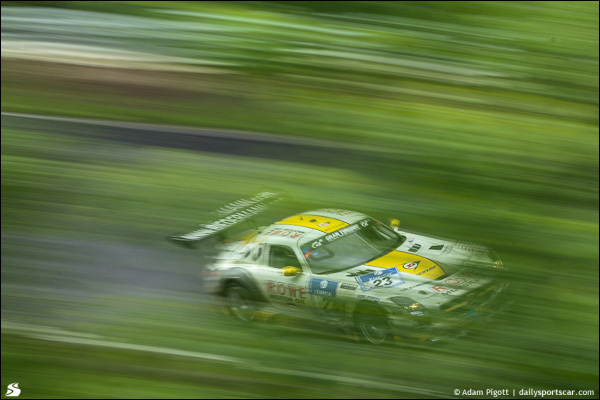 The legendary foxtail Opel Manta, of course, received the biggest cheer of the weekend. And that was it. The race had finished. The crowd slowly dispersed. The currywurst outlets had shut their doors and we were left to reflect on what had been an excellent weekend of motor sport at one of the finest racing circuits in the whole of Europe, maybe even the world. More impressively we’d done it all (petrol, travel, food and accommodation) for no more than a weekend at the British Grand Prix. What’s not to like?